After visiting Creevelea Abbey we decided to pop over to these two tombs. We arrived at Tullyskeherny quite late in the afternoon. The day was quite wet and dreary, but still it was a joy to meet the farmer who owned the land here at Tullyskeherny, a real gentleman. He gave us permission to visit and told us it was possible to drive right up to the tombs. He also gave us information about the nearby cashel. We drove down the track to the furthest tomb, the SE one. Sadly these tombs are in a bad state of ruin. It is almost impossible to make out their original layout. 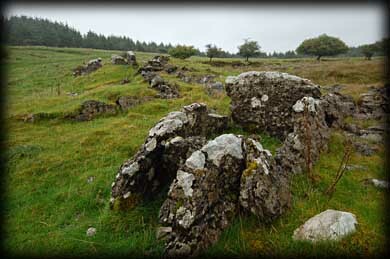 The southern tomb is a large oval Cairn about 25 metres in length and has a gallery consisting of two chambers. Each of these chambers are about 2.5 metres wide. 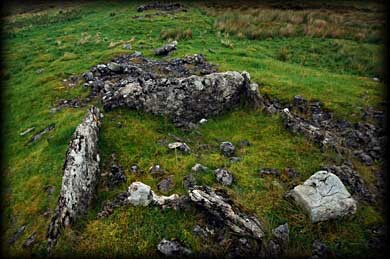 The rear chamber pictured above is about 2 metres long and the southern one at 3 metres is longer, but filled with cairn material. There is also evidence of a subsidiary chamber at the rear of the gallery. The court was situated at the southern end of this tomb. As you can see from the picture right, the cairn material is strewn all over the south eastern side of the tomb. I wish the weather had been kinder on our visit, due to the rain we quickly made our way up to the northern tomb. At first the northern tomb seemed even trickier, this is due to some of the cairn being quarried to build the track running down passed the tombs. 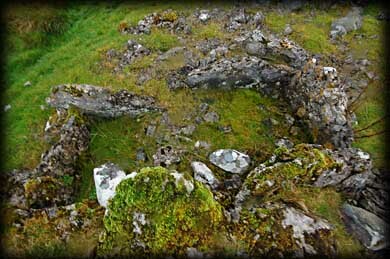 The top image was taken from the north eastern end of the tomb, the stones in the centre are the remains of the eastern side of the court. This tomb also had a gallery with two chambers. 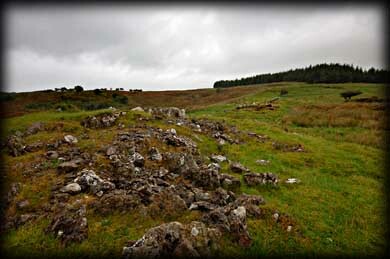 Built into the cairn are at least six subsidiary chambers, some of which are in excellent condition. . This area is a small karst-landscape region and all the chambers of both tombs are made up from limestone slabs. 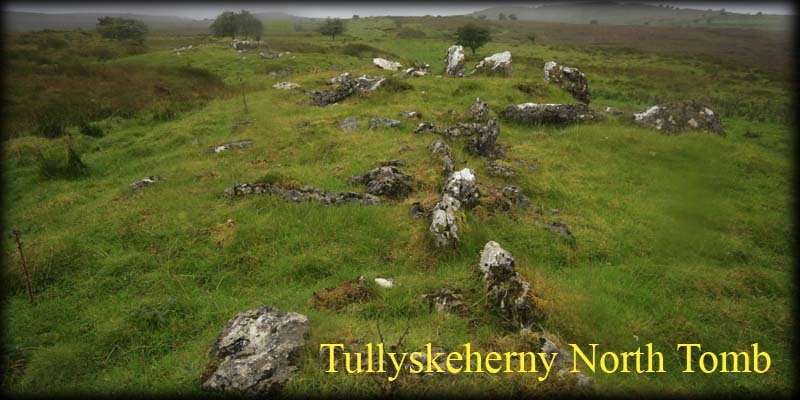 Hopefully we will return to Tullyskeherny in the future and also get a chance to visit the nearby Cashel. But only if the weather is better than this trip as the area is quite exposed to the elements. Situated: From Manorhamilton take the M 16 east towards Glenfarne. After 500 metres take a right turn. After 1 .5 kilometres you will come to a fork in the road keep left. Then the road bends sharp left. 100 metres down here on your right is a gate. Go through the gate and after 200 metres you should see the tombs. Discovery Map 16: G 899 370. Last visit September 2010.